What was Agassi's baseline game strategy? He looked as though he was absolutely caning every single ball, and yet made very few unforced errors. How was he able to basically hit hard and consistently? Um, "hit the ball hard?" True, he played smarter when he got a bit older....he used the court a lot more. I think in a way it dimished his potential a bit. He stopped going to net, he lost rallies against the likes of Sampras too often becuase Pete would be the one to take the risk. Of course Andre's career had other issues. Perhaps; his net play was always a bit meh. Aggressive baseliner. Liked to dictate from the back of the court. Wasn't a great mover or vollier, so he would try and stand in the center of the court and run his opponent. Had a great return of serve, would stand close to the baseline and crack returns. Had short backswings and excellent timing on ground strokes. Agassi has relatively simple ground stroke technique on both sides - little to go wrong. He also seemed to see the ball earlier than most other tennis players - including pros. All of this adds up to him being able to stand right up on the baseline and rip ground strokes over and over. Not sure what his strategy was when he was younger (image was everything back then). But as he got older, he became quite a tactician - always had a specific strategy for every match. One of his general strategies though, was to make his opponent feel pain. As far as I recall, his strategy was to control the middle of the court and to limit his own movement. Run his opponent back and forth. I don't recall him having real point-ending tendencies, but he wasn't a pusher either by any means. I think that was one of his problems - okay, you're moving your opponent, now what? completely agree. 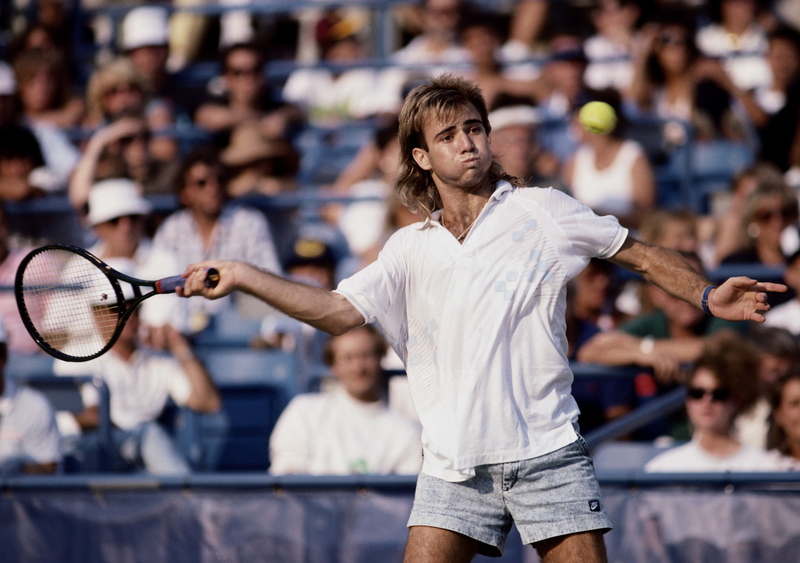 If the opponent could keep getting back the ball to a decent length, Agassi was in trouble. Early Agassi would have moved in to cut off a high ball, & he could have improved his net play to become a better player. Agree - control the center of the court, and make opponents move - those were his break and butter. Seems to me he did improve his net play as he aged, added a slice backhand, and improved his serve. Take the ball early, work the angles, make opponent run and suffer. 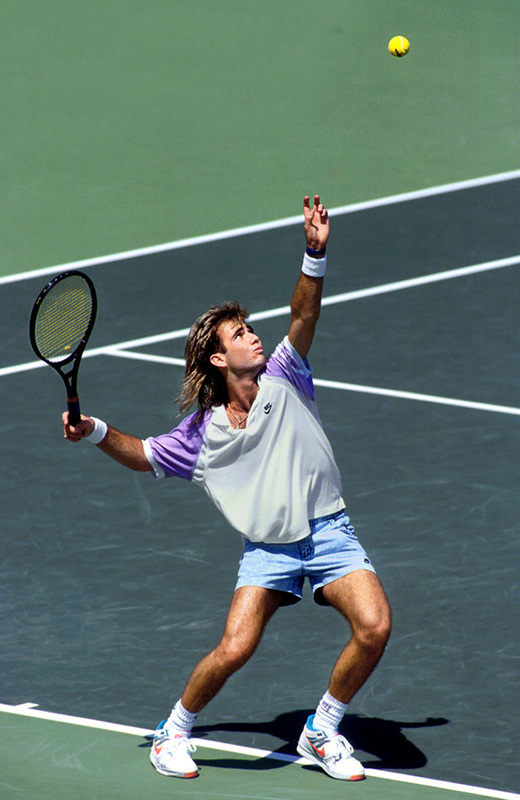 Early Agassi was more brash and went for lots of winners as said before. He hit relatively flat, around 1500 rpms on forehands. Exceptional eye / hand coordination was allowing him to take the ball on the rise and play very close, or even inside, the baseline, therefore taking time away from his opponents. He was not trying to overpower his opponents like e.g. Lendl or Courier, but to play at a speed they couldn't cope with. The same hand/ eye coordination ensured that he was exceptional on the return of serve, which was handy against S/V players, and his reading of the game was so good that he was rarely out of position despite not being the most athletically gifted player. That, and the fact that his game re-balanced significantly between forehand and backhand in the second half of his career. He started with a booming forehand, and a good if unspectacular backhand. He then transition to less winners / more margin on the forehand, and arguably one of the best two handed backhands in history. The ability to be dangerous on both wings is what enabled him to put pressure on opponents and led to his late successes. By moving the other guy around, Agassi... shall we say, 'strongly encouraged' them to make errors? 'invited them to make errors'? 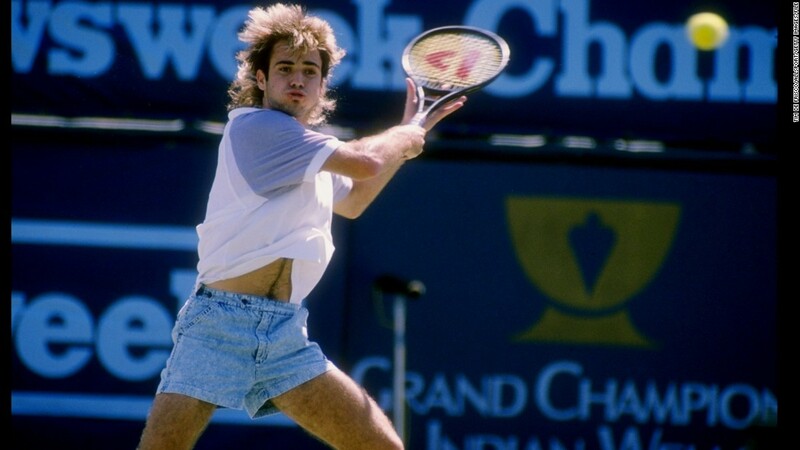 Second, Agassi's one of the best when it comes to hitting on the rise.... he'd routinely virtually half-volley balls of the baseline with power. Just balls to the walls go for broke aggression... but that's a poor long term strategy. You'll make too many errors for it to work for long. Sampras could get away with it because Sampras could take care of his service games from the net, so he'd only being playing this way on return games. Yep. Take the ball early, hit it on the rise. Don't give your opponent time. A great strategy that Pat Rafter used to employ was to hit no pace balls to agassi , particularly slice off the BH. Obvioulsy you had to be an excellent mover to pull it off and it would work best on low bouncing grass, but Agassi struggled to hit winners because he had to generate his own pace, which was against his counterpunching style. I always aksed myself same thing. Similiar with Davydenko. It seems onyl logical answer is took the ball early. The guy was sensational at the beginning. I remember that I was very undecided whether to cheer him or Pete. Sampras was (almost) perfect, he played a tennis more similar to what I played: classic style. Andre played like a "pinball machine" (or "flipper" in Europe), he was a speeded Jimbo. He played ping-pong on a tennis court.WOOOOOOW. He did a great and long career even if very discontinuous, but I liked a lot more at the beginning, when he not won or won little (as in basketball I liked a lot more Shaq, Garnett and Jordan early career, not winning but devastating) . Agassi at the beginning of career seemed to me a player who came from another planet even if he did not win. Then he won a lot but I did not seem to come from another planet anymore. Agassi expertly employed something I coach that I call 'automatic shots'. Since it's impossible to be able to decide 'where am I going to hit this ball?' on every shot so you have to decide ahead of time where you're going to hit for those times when you are rushed and don't have much time. More often that not Agassi would 'automatically' hit the ball crosscourt, changing it up on shots where he had more time or could step inside the court more. So while some people often find themselves having to just get the ball back when they are rushed, Agassi was hitting a much higher % of his shots with purpose. Part of why this simple strategy worked so well for him was because he could pretty much drive the ball equally well off his forehand and backhand, something few players can do. So he'd control the center of the court on his side, and he would, by the use of automatic shots, keep his opponents off center on their side then take control of the point outright when he had more time or got to move inside the baseline more. When he was on song you didn't get much chance to relax during a point against him. Also agree about the changes in his playing style over the years. The very young Andre is an icon character for me. I've seen on this thread that Agassi wasn't a great mover and that he didn't overpower opponents. My feeling is that he was incredibly fast and that he hit the ball as hard as anyone ever had at the time. Would be interested to hear your take on Agassi at different times in his career? Andre was fast at times, but his footwork was a little dicey. He was ok side to side, not so good in the forecourt. Again, not that he was bad per se, but compared to a Borg or Connors, not quite as good. Andre had such fantastic ball striking ability, it compensated for it. However, there were times when I did not think he was such a great thinker in how he used the court...but he got better with age.